...is not the title of a film (or song) but the 'short story' about me having to visit Paris in order to get my passport renewed. This first time only for the photos, papers and fingerprints. I don't complain. Paris is a fantastic town. On the same time I'm actually glad living in a small town like La Châtre and this for many reasons. First of all it's very expensive living in Paris, if you don't want to live in a small 'studio' in the terrible suburbs, paying a rent that is sufficient for a three room apartment in La Châtre. Secondly the town is rather filthy and malodorous, I'm sorry to say. Thirdly the pollution from the cars - as in any other major town - is terrible. The scooter and motorcycle drivers are people you feel inclined to kill! The advantages of having fresh vegetables and fruits from your own (or your father-in-laws) garden, is another advantage, not easily realizable either. There are fine markets, as we all know but it's however not the same. Spending two weeks in the capital is though wonderful, giving you an opportunity to visit museums, exhibitions, concerts, see a lot of films, theatrical performances etc etc. This time it lasted one day but I have to return once again in order to get my passport and we'll see what happens then. During this visit I met one of my cousin Lars' daughters, Jenny, working as a make up-artist in connection with fashion parades. 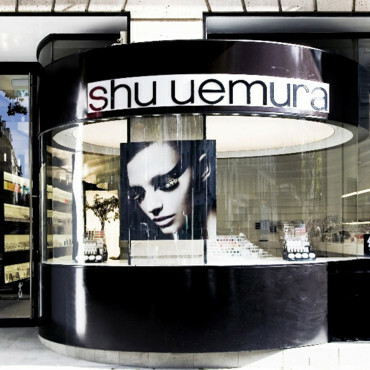 The company where she is emplyed is Shu Uemura (176 Boulevard Saint-Germain-des-Près). I had planned to say hello to her sister Elin too (working as a stylist) but she was working in another town this day. Jenny and I ate a lunch and had a good time talking about this and that.